A delicious spring/summer dish that takes only 25 minutes and 4 ingredients! While oven pre-heats, wash and pat dry your salmon. Place in a baking dish and drizzle with olive oil and salt and pepper to your liking. Place salmon in oven and cook for 25 minutes. 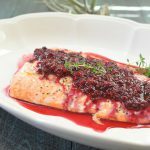 While salmon cooks, prepare your blackberry sauce. In a medium saucepan over medium heat, add your blackberries, thyme leaves, honey, and a pinch of salt. Mash ingredients with a potato masher until you reach a syrupy consistency. Remove from heat and allow to sit until salmon is done. When the timer goes off, check to make sure your salmon is a nice flaky consistency. If it isn’t quite there yet (depending on the thickness of fish) allow to bake for another 5 minutes. Check again. Once the salmon is done, pour blackberry sauce over the salmon, reserving some for individual toppings.